So this week I wanted to share another recipe with you. It’s an adaptation of the very first recipe that I ever learned (I was six years old) so it’s pretty dear to my heart. 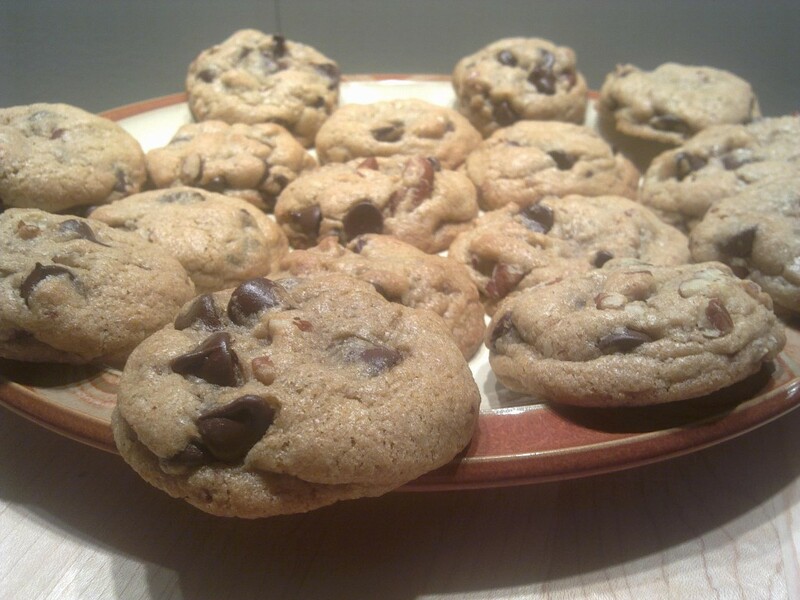 I have a thing for making chocolate chip cookies. Eating them isn’t so much the goal – it’s really just about the process of making them. It’s a little ritual that I practice whenever I’m in a new living situation. There’s something very soothing about it (maybe you can relate) and it brings a sense of being at home no matter where I am. In a small pan over low heat, melt butter, cane sugar and brown sugar. Stir to combine and remove from heat. Cool for at least 10 minutes. Transfer butter-sugar mixture to a medium bowl. Add vanilla extract. Add eggs, one at a time, beating well after each addition. Stir in morsels and nuts and CHILL the dough completely-at least 4 hours. Drop rounded tablespoons of dough onto ungreased baking sheets. Bake for 8-10 minutes – halfway through the baking time turn the pan 180 degrees. Allow cookies to cool before transferring. COOL the pans completely before baking another batch (option: run cold water over the pans). Another trick is to use parchment paper to help reduce clean up. I like to store the cookies in the freezer in small ziplock bags and share them with as many people as possible.